Could also be embroidered with Two Hearts intertwined. Stitch / Colonial Knot Combination., Y Stitch. little more difficult to remove from the fleece. stem stitch the outline of the heart. 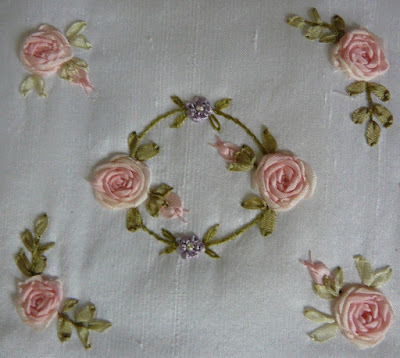 for the spider web rose, one at a time and embroider. So as not to get the ribbon tangled in the other threads. After making the spoke, do not cut thread, leave it at the back of your work. Thread ribbon 25 cm in length onto Chenille Needle supplied. at the back of the fabric. Stitch down with thread. Complete all Spider Web Roses in this way. Stem Stitch in Green thread, the stems of the Leaves. 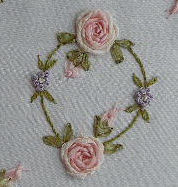 Place fabric now in Embroidery Hoop. All the other stitching can be done with fabric in the hoop. 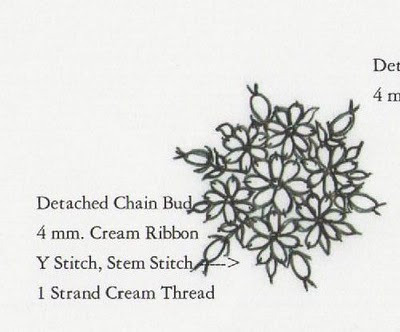 Detached Chain Buds: This stitch is the same as Lazy Daisy in Thread. Cut Ribbon no longer than 25 cm. 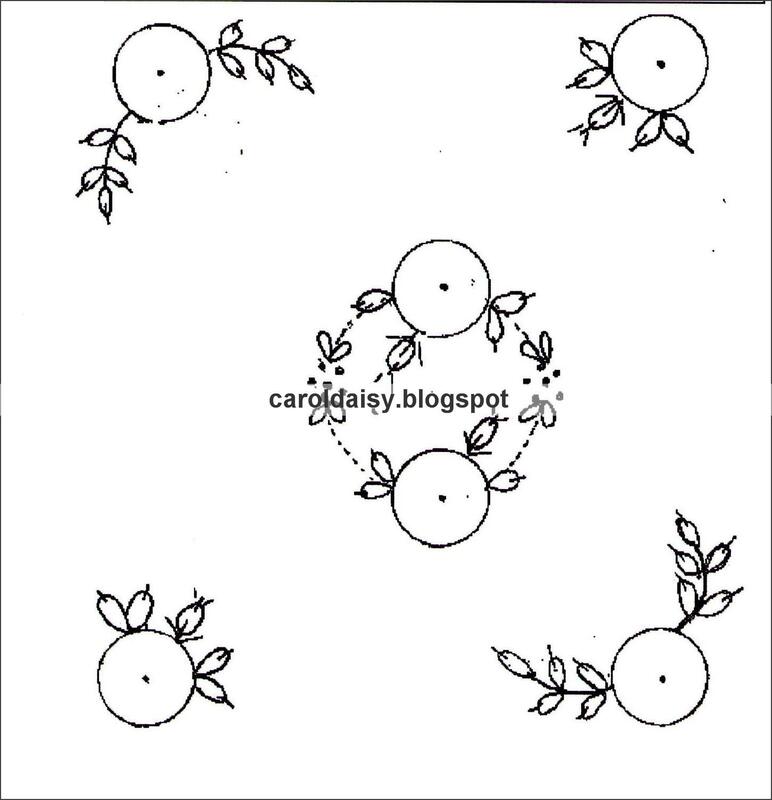 and make the buds in each group. With green thread make small straight stitches at the tips and Y stitch around the bud and add a stem. 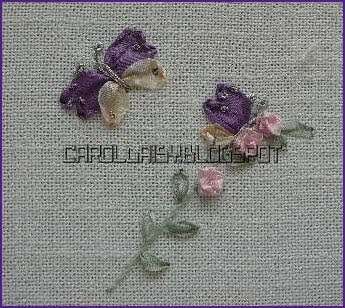 Ribbon Stitch Leaves: With green ribbon make all the leaves, be careful not to pull the ribbon after each one, best if you keep your finger on the last completed stitch while you are making your next. 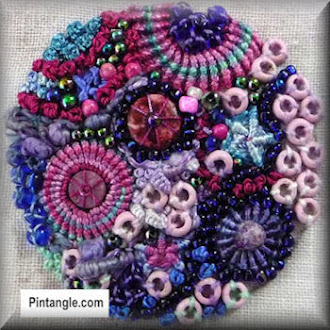 stitch into a circle. Add stitches between to keep flat. above it and the steam should lift it slightly. Do Not press the ribbon once you have stitched it in. enlarge to whatever size you desire. For further assistance go to the stitch tutorials. same way as Running Stitch / French Knot. and will give a higher centre to the flower. These are from a discontinued Introductory Kit. Satin -n-Cream on a Baby Quilt or for Doll Collectors. But I am sure you will find many other uses. The single stem was added at each corner of the quilt. The design above was a feature on the edge of a pillowslip. easier to keep the material firm. 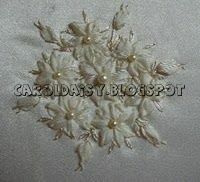 make sure the ribbon is not twisted, before pulling the needle through, this will give the petals a flatter appearance. 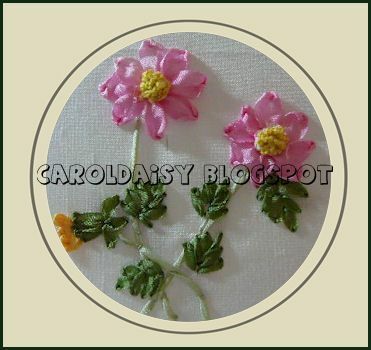 Complete all the daisy's, then stitch down the beads for the centre. for the calyx. 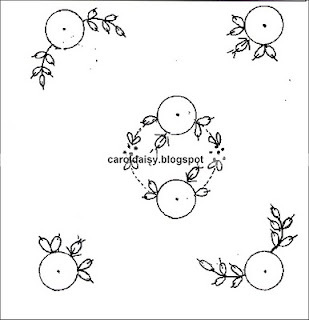 Next add some lazy daisy leaves, in 1 strand also. Here are some simple combinations for this simple stitch. 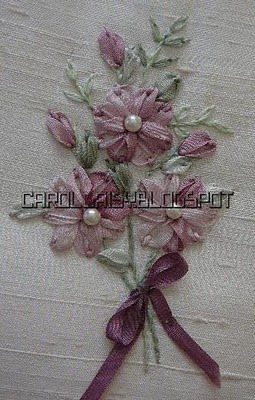 Ribbon Stitch, Straight Stitch, Detached Chain Stitch. Rose Leaves – Green Ribbon – 4 mm. make 2 small straight stitches at the top of the bud. French Knot Flowers: 2 Strands of Lilac and 3 wraps. Centre: 2 Strands of Cream and 3 wraps make the centre. 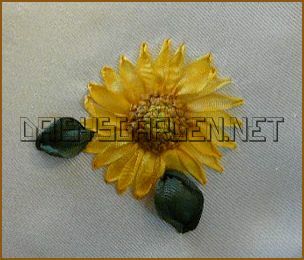 Lazy Daisy leaves in Thread at each French Knot Flower. the bride, lingerie, baby's clothes, and any item of a delicate nature. then *** bingo, it takes a whole new direction. sometimes I even get withdrawal symptoms. Dinky Dyes 4 mm. Wattle. So logically you need to average 6 petals in each quarter, slightly crossing over into the next. and an inner circle of 1.5 cms. size 1.5 cms. ( 1/2 inch). 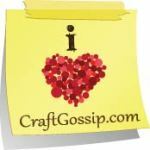 make small tacking stitches approx. off securely, so it does not loosen. through just outside the outer circle. firmly with the sewing thread. appearing from between the flower petals. Seed Beads for the Centre. the addition of Stitches in thread. 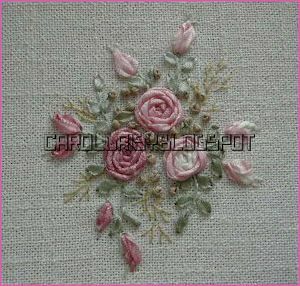 french knots centres to name a few. with a vast knowledge of textiles. project by all means have a look at this site. Island, where I am living at the moment. wish to use in the future. But I am sure you can get the idea from these photos. They were all worked within a 10 c x 10 cm. square. for the stripes, legs and French knot for the eye. 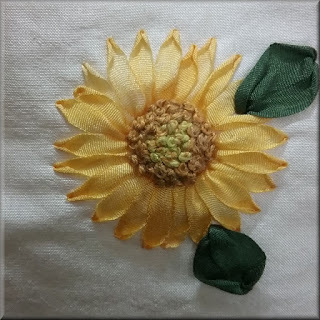 French Knots in Embroidery Cotton for Daisy Centre. Running Stitch / French Knot Comb. Flowers. 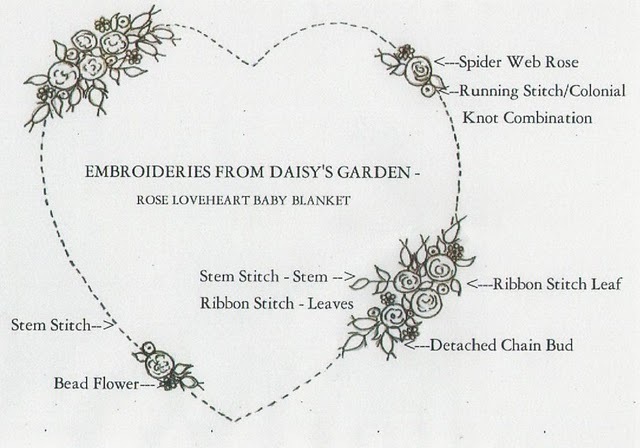 were mainly focused on Lazy Daisy Stitch. detailed tutorial in Silk Ribbon. 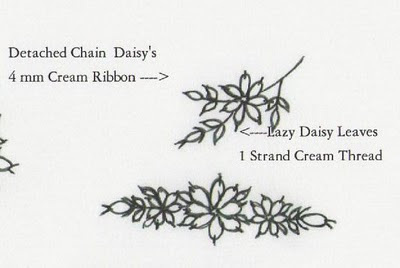 Detached Chain Flower spray to adorn a Satin Baby Quilt. Could also be added to any Bridal Accessories. 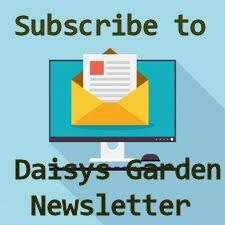 is executed in much the same way as Lazy Daisy. The wider ones are more difficult to shape. or free in the hand. leaving both hands free to work the ribbon. When using a hoop it is difficult to take the needle diagonally across the fabric. blood stains on your work. 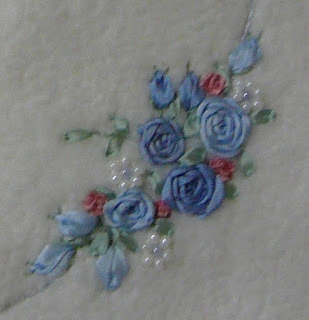 If doing this free hand take care that the fabric is not gathering as you stitch. to be flattened out and smooth. with a twist then you get a thinner petal. at the top and did not straighten out the ribbon. Not the same desired effect, do you agree. and straighten out the ribbon. 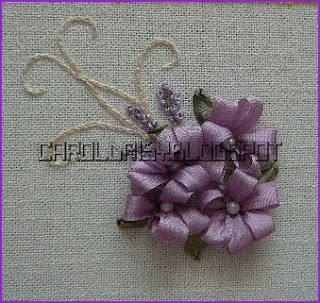 with thread, and you will have more control over the shaping of the petal. you will be making a slight tip to the petal. have been possible to add a seventh. ( with 4 mm. ribbon ). addition of a pearl, the flower takes shape. leaf and add Detached Chain Leaves. Also can be used for buds as in the Rosebud Tutorial. quite often in Silk Ribbon Embroidery.